It's time for my second Halloween nail art design and this one was actually inspired by a pin badge. 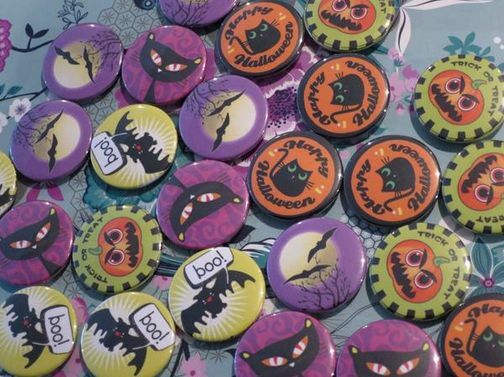 The lovely Vicki from Lets Talk Beauty has a badge business called Kool Badges. When the Kool Badges Twitter account tweeted a picture of a selection of their Halloween badges there was one particular design that I thought would look great as nail art. So I gave it a try. 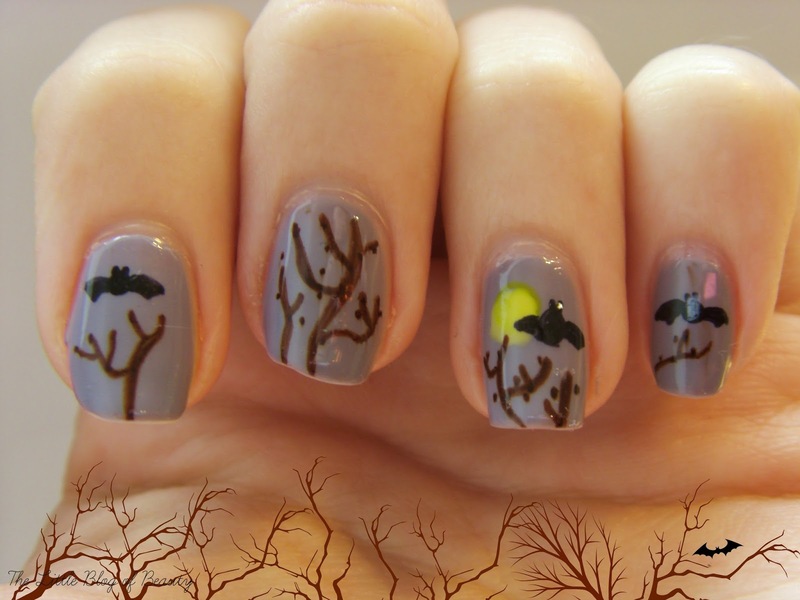 Can you tell I love playing around with Picmonkey when it comes to my Halloween nail art images? The badge that inspired me features a purple coloured sky with the tops of winter bare trees just visible at the bottom and bats flying in front of a large yellow moon. The closest base colour I could find in my collection came in the form of Ciate's Pillow fight, which is a light grey with a hint of lilac (according to the Ciate website). It's not as purple as the night sky on the badge, although it does look a little more lilac in person than in these photos, but I think it did work quite well as a spooky night base. I only wanted one moon, as there is only one moon in the sky, so I used a blob of a yellow Barry M shade on my ring finger. I'm sorry I don't know what the yellow shade is called but it's quite an old one. I then used a brown Sharpie to draw on the trees (this doesn't quite look how I wanted it to!) and then a black Sharpie to draw on some bats (these didn't quite go to plan either, some look a little poorly!). I then left this to dry for a while before sealing with a glossy top coat. It looks a little rough but I'm quite pleased with this one and although my nails are smaller than a pin badge I think I've just about managed to squeeze the complete design on my ring finger, minus a bat! 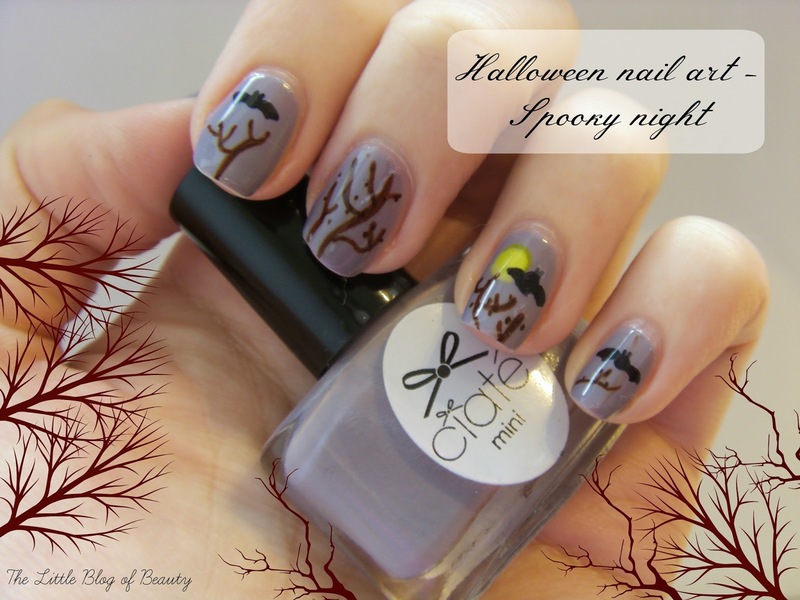 What do you think of Spooky night nail art?